African-American artists in the 21st century have embraced every art form, style, and new development, as well as pioneering many on their own. They have the added distinction of contributing a unique vision to American art based on the history of black culture in America, and its rich foundations in African art. Self-taught artists have a long history in many western cultures, and, in the United States, particularly in the African American community. If an inquiring art historian mind thinks about it, “self-taught” probably describes 90 per cent of the artists on the planet. In the instance of African American art, it is particularly important, because African slaves in the US passed on their knowledge of African artistic traditions from one generation to another. This rich history, in an amazing variety of art forms, sure was not going to be taught at the National Academy of Design in New York or the Pennsylvania Academy of Fine Arts in Philadelphia, the two premier “art schools” of the 1800s! The term I like the best for this genre of art is “visionary,” because it really is. William Edmondson was born in Nashville of former slaves. He worked a number of different jobs, including as a stonemason in the building trade. 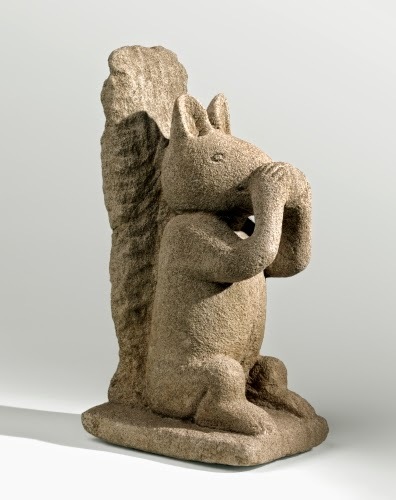 When the Depression affected construction jobs, he began carving stone sculpture around 1931, intrigued by the solid dignity and enduring quality of the stone medium. Edmondson had no training in sculpture or painting, nor had he studied American or European art. He believed that God had told him to become a sculptor and carve pieces of limestone, which he had gathered, lying in his driveway. He initially began carving tombstones that he sold to members of his church. Eventually he began carving non-utilitarian works. He carved limestone exclusively because it was abundant locally and inexpensive. Most of it was discarded sections of street curbstones. Sometimes he could find larger pieces on the sites of building demolitions. He used tools he fashioned himself from old railroad spikes. Famous fashion photographer Louise Dahl-Wolfe (1895–1989, US) met Edmondson in 1937. She photographed him in his studio in Nashville, working and with his pieces. Dahl-Wolfe helped organize a show of twelve of his works at the Museum of Modern Art in New York. He was the first African American artist to have a one-person show at the Museum of Modern Art. He was twice employed in the sculpture division of the Works Progress Administration during the Great Depression (1929–1940), and had many shows of his work subsequent to MoMA. He was also photographed in the 1930s by the photojournalist Consuelo Kanaga (1894–1978), one of the first American photographers to document the lives and struggles of African Americans. Many of Edmondson’s subjects involve the animal world. His early non-tombstone work involved many Biblical subjects, including animals that were symbolic in the Bible, such as doves. When he expanded his figurative work to non-religious subjects, he also included the range of animals he depicted. Many of the animals he chose have symbolic significance in African art. The African ground squirrel, for example, was considered to be endowed with sharp wits, resourcefulness, and protection of family. This piece is most likely the first of many versions he did of this subject, most in the same pose.